We stepped into the big controversy last week and asked if your church would be closed on Christmas Sunday. And wow, we haven’t had this kind of poll activity since the great hat debate of August. It seems 68% of churches are doing something different on Christmas Sunday, either scaling back their services or canceling them altogether. 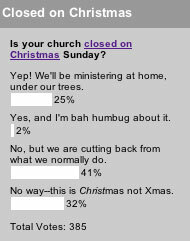 It’s also interesting that only 2% of people attend a church that will be closed on Christmas and are upset about it. That says to me that this whole mess of an issue is mostly people getting upset about what churches that aren’t their own are doing. If it’s not your church I doubt you can understand all the rationale for their decision. I mean, they’re not having a Satan-worshipping service or burning Bibles or anything blatantly opposed to the creedal faith, so lay off. That’s my two cents anyway. That and the fact that a church issue made such a wave in the media–who says church marketing isn’t important? This week we’re having a bit of fun and asking what you want for Christmas. Why is this such an issue? I don’t get it. Thank you for pointing this out. Great blog! A church in our area distributed 1500 DVD’s of their own prerecorded service so families could watch the Christmas service, without ever having to leave their home.